"SUSY" redirects here. For other uses, see Susy (disambiguation). For the episode of the American TV series Angel, see Supersymmetry (Angel). In particle physics, supersymmetry (SUSY) is a principle that proposes a relationship between two basic classes of elementary particles: bosons, which have an integer-valued spin, and fermions, which have a half-integer spin. A type of spacetime symmetry, supersymmetry is a possible candidate for undiscovered particle physics, and seen as an elegant solution to many current problems in particle physics if confirmed correct, which could resolve various areas where current theories are believed to be incomplete. A supersymmetrical extension to the Standard Model would resolve major hierarchy problems within gauge theory, by guaranteeing that quadratic divergences of all orders will cancel out in perturbation theory. In supersymmetry, each particle from one group would have an associated particle in the other, which is known as its superpartner, the spin of which differs by a half-integer. These superpartners would be new and undiscovered particles. For example, there would be a particle called a "selectron" (superpartner electron), a bosonic partner of the electron. In the simplest supersymmetry theories, with perfectly "unbroken" supersymmetry, each pair of superpartners would share the same mass and internal quantum numbers besides spin. Since we expect to find these "superpartners" using present-day equipment, if supersymmetry exists then it consists of a spontaneously broken symmetry allowing superpartners to differ in mass. Spontaneously-broken supersymmetry could solve many mysterious problems in particle physics including the hierarchy problem. There is no evidence at this time to show whether or not supersymmetry is correct, or what other extensions to current models might be more accurate. In part this is because it is only since around 2010 that particle accelerators specifically designed to study physics beyond the Standard Model have become operational, and because it is not yet known where exactly to look nor the energies required for a successful search. The main reasons for supersymmetry being supported by physicists is that the current theories are known to be incomplete and their limitations are well established, and supersymmetry would be an attractive solution to some of the major concerns. Direct confirmation would entail production of superpartners in collider experiments, such as the Large Hadron Collider (LHC). The first runs of the LHC found no previously-unknown particles other than the Higgs boson which was already suspected to exist as part of the Standard Model, and therefore no evidence for supersymmetry. Indirect methods include the search for a permanent electric dipole moment (EDM) in the known Standard Model particles, which can arise when the Standard Model particle interacts with the supersymmetric particles. The current best constraint on the electron electric dipole moment put it to be smaller than 10−28 e·cm, equivalent to a sensitivity to new physics at the TeV scale and matching that of the current best particle colliders. A permanent EDM in any fundamental particle points towards time-reversal violating physics, and therefore also CP-symmetry violation via the CPT theorem. Such EDM experiments are also much more scalable than conventional particle accelerators and offer a practical alternative to detecting physics beyond the standard model as accelerator experiments become increasingly costly and complicated to maintain. These findings disappointed many physicists, who believed that supersymmetry (and other theories relying upon it) were by far the most promising theories for "new" physics, and had hoped for signs of unexpected results from these runs. Former enthusiastic supporter Mikhail Shifman went as far as urging the theoretical community to search for new ideas and accept that supersymmetry was a failed theory. However it has also been argued that this "naturalness" crisis was premature, because various calculations were too optimistic about the limits of masses which would allow a supersymmetry based solution. There are numerous phenomenological motivations for supersymmetry close to the electroweak scale, as well as technical motivations for supersymmetry at any scale. Supersymmetry close to the electroweak scale ameliorates the hierarchy problem that afflicts the Standard Model. In the Standard Model, the electroweak scale receives enormous Planck-scale quantum corrections. The observed hierarchy between the electroweak scale and the Planck scale must be achieved with extraordinary fine tuning. In a supersymmetric theory, on the other hand, Planck-scale quantum corrections cancel between partners and superpartners (owing to a minus sign associated with fermionic loops). The hierarchy between the electroweak scale and the Planck scale is achieved in a natural manner, without miraculous fine-tuning. The idea that the gauge symmetry groups unify at high-energy is called Grand unification theory. In the Standard Model, however, the weak, strong and electromagnetic couplings fail to unify at high energy. In a supersymmetry theory, the running of the gauge couplings are modified, and precise high-energy unification of the gauge couplings is achieved. The modified running also provides a natural mechanism for radiative electroweak symmetry breaking. TeV-scale supersymmetry (augmented with a discrete symmetry) typically provides a candidate dark matter particle at a mass scale consistent with thermal relic abundance calculations. Supersymmetry is also motivated by solutions to several theoretical problems, for generally providing many desirable mathematical properties, and for ensuring sensible behavior at high energies. Supersymmetric quantum field theory is often much easier to analyze, as many more problems become mathematically tractable. When supersymmetry is imposed as a local symmetry, Einstein's theory of general relativity is included automatically, and the result is said to be a theory of supergravity. It is also a necessary feature of the most popular candidate for a theory of everything, superstring theory, and a SUSY theory could explain the issue of cosmological inflation. Another theoretically appealing property of supersymmetry is that it offers the only "loophole" to the Coleman–Mandula theorem, which prohibits spacetime and internal symmetries from being combined in any nontrivial way, for quantum field theories like the Standard Model with very general assumptions. The Haag–Łopuszański–Sohnius theorem demonstrates that supersymmetry is the only way spacetime and internal symmetries can be combined consistently. A supersymmetry relating mesons and baryons was first proposed, in the context of hadronic physics, by Hironari Miyazawa in 1966. This supersymmetry did not involve spacetime, that is, it concerned internal symmetry, and was broken badly. Miyazawa's work was largely ignored at the time. J. L. Gervais and B. Sakita (in 1971), Yu. A. Golfand and E. P. Likhtman (also in 1971), and D. V. Volkov and V. P. Akulov (1972), independently rediscovered supersymmetry in the context of quantum field theory, a radically new type of symmetry of spacetime and fundamental fields, which establishes a relationship between elementary particles of different quantum nature, bosons and fermions, and unifies spacetime and internal symmetries of microscopic phenomena. Supersymmetry with a consistent Lie-algebraic graded structure on which the Gervais−Sakita rediscovery was based directly first arose in 1971 in the context of an early version of string theory by Pierre Ramond, John H. Schwarz and André Neveu. Finally, Julius Wess and Bruno Zumino (in 1974) identified the characteristic renormalization features of four-dimensional supersymmetric field theories, which identified them as remarkable QFTs, and they and Abdus Salam and their fellow researchers introduced early particle physics applications. The mathematical structure of supersymmetry (graded Lie superalgebras) has subsequently been applied successfully to other topics of physics, ranging from nuclear physics, critical phenomena, quantum mechanics to statistical physics. It remains a vital part of many proposed theories of physics. The first realistic supersymmetric version of the Standard Model was proposed in 1977 by Pierre Fayet and is known as the Minimal Supersymmetric Standard Model or MSSM for short. It was proposed to solve, amongst other things, the hierarchy problem. One reason that physicists explored supersymmetry is because it offers an extension to the more familiar symmetries of quantum field theory. These symmetries are grouped into the Poincaré group and internal symmetries and the Coleman–Mandula theorem showed that under certain assumptions, the symmetries of the S-matrix must be a direct product of the Poincaré group with a compact internal symmetry group or if there is not any mass gap, the conformal group with a compact internal symmetry group. In 1971 Golfand and Likhtman were the first to show that the Poincaré algebra can be extended through introduction of four anticommuting spinor generators (in four dimensions), which later became known as supercharges. in 1975 the Haag–Lopuszanski–Sohnius theorem analyzed all possible superalgebras in the general form, including those with an extended number of the supergenerators and central charges. This extended super-Poincaré algebra paved the way for obtaining a very large and important class of supersymmetric field theories. Traditional symmetries of physics are generated by objects that transform by the tensor representations of the Poincaré group and internal symmetries. Supersymmetries, however, are generated by objects that transform by the spin representations. According to the spin-statistics theorem, bosonic fields commute while fermionic fields anticommute. Combining the two kinds of fields into a single algebra requires the introduction of a Z2-grading under which the bosons are the even elements and the fermions are the odd elements. Such an algebra is called a Lie superalgebra. There are representations of a Lie superalgebra that are analogous to representations of a Lie algebra. Each Lie algebra has an associated Lie group and a Lie superalgebra can sometimes be extended into representations of a Lie supergroup. Incorporating supersymmetry into the Standard Model requires doubling the number of particles since there is no way that any of the particles in the Standard Model can be superpartners of each other. With the addition of new particles, there are many possible new interactions. The simplest possible supersymmetric model consistent with the Standard Model is the Minimal Supersymmetric Standard Model (MSSM) which can include the necessary additional new particles that are able to be superpartners of those in the Standard Model. One of the main motivations for SUSY comes from the quadratically divergent contributions to the Higgs mass squared. The quantum mechanical interactions of the Higgs boson causes a large renormalization of the Higgs mass and unless there is an accidental cancellation, the natural size of the Higgs mass is the greatest scale possible. This problem is known as the hierarchy problem. Supersymmetry reduces the size of the quantum corrections by having automatic cancellations between fermionic and bosonic Higgs interactions. If supersymmetry is restored at the weak scale, then the Higgs mass is related to supersymmetry breaking which can be induced from small non-perturbative effects explaining the vastly different scales in the weak interactions and gravitational interactions. In many supersymmetric Standard Models there is a heavy stable particle (such as neutralino) which could serve as a weakly interacting massive particle (WIMP) dark matter candidate. The existence of a supersymmetric dark matter candidate is related closely to R-parity. The standard paradigm for incorporating supersymmetry into a realistic theory is to have the underlying dynamics of the theory be supersymmetric, but the ground state of the theory does not respect the symmetry and supersymmetry is broken spontaneously. The supersymmetry break can not be done permanently by the particles of the MSSM as they currently appear. This means that there is a new sector of the theory that is responsible for the breaking. The only constraint on this new sector is that it must break supersymmetry permanently and must give superparticles TeV scale masses. There are many models that can do this and most of their details do not matter. In order to parameterize the relevant features of supersymmetry breaking, arbitrary soft SUSY breaking terms are added to the theory which temporarily break SUSY explicitly but could never arise from a complete theory of supersymmetry breaking. One piece of evidence for supersymmetry existing is gauge coupling unification. The renormalization group evolution of the three gauge coupling constants of the Standard Model is somewhat sensitive to the present particle content of the theory. These coupling constants do not quite meet together at a common energy scale if we run the renormalization group using the Standard Model. With the addition of minimal SUSY joint convergence of the coupling constants is projected at approximately 1016 GeV. Supersymmetric quantum mechanics adds the SUSY superalgebra to quantum mechanics as opposed to quantum field theory. Supersymmetric quantum mechanics often becomes relevant when studying the dynamics of supersymmetric solitons, and due to the simplified nature of having fields which are only functions of time (rather than space-time), a great deal of progress has been made in this subject and it is now studied in its own right. SUSY quantum mechanics involves pairs of Hamiltonians which share a particular mathematical relationship, which are called partner Hamiltonians. (The potential energy terms which occur in the Hamiltonians are then known as partner potentials.) An introductory theorem shows that for every eigenstate of one Hamiltonian, its partner Hamiltonian has a corresponding eigenstate with the same energy. This fact can be exploited to deduce many properties of the eigenstate spectrum. It is analogous to the original description of SUSY, which referred to bosons and fermions. We can imagine a "bosonic Hamiltonian", whose eigenstates are the various bosons of our theory. The SUSY partner of this Hamiltonian would be "fermionic", and its eigenstates would be the theory's fermions. Each boson would have a fermionic partner of equal energy. SUSY concepts have provided useful extensions to the WKB approximation. Additionally, SUSY has been applied to disorder averaged systems both quantum and non-quantum (through statistical mechanics), the Fokker-Planck equation being an example of a non-quantum theory. The 'supersymmetry' in all these systems arises from the fact that one is modelling one particle and as such the 'statistics' do not matter. The use of the supersymmetry method provides a mathematical rigorous alternative to the replica trick, but only in non-interacting systems, which attempts to address the so-called 'problem of the denominator' under disorder averaging. For more on the applications of supersymmetry in condensed matter physics see Evetov (1997). All stochastic (partial) differential equations, the models for all types of continuous time dynamical systems, possess topological supersymmetry. In the operator representation of stochastic evolution, the topological supersymmetry is the exterior derivative which is commutative with the stochastic evolution operator defined as the stochastically averaged pullback induced on differential forms by SDE-defined diffeomorphisms of the phase space. The topological sector of the so-emerging supersymmetric theory of stochastic dynamics can be recognized as the Witten-type topological field theory. The meaning of the topological supersymmetry in dynamical systems is the preservation of the phase space continuity—infinitely close points will remain close during continuous time evolution even in the presence of noise. When the topological supersymmetry is broken spontaneously, this property is violated in the limit of the infinitely long temporal evolution and the model can be said to exhibit (the stochastic generalization of) the butterfly effect. From a more general perspective, spontaneous breakdown of the topological supersymmetry is the theoretical essence of the ubiquitous dynamical phenomenon variously known as chaos, turbulence, self-organized criticality etc. The Goldstone theorem explains the associated emergence of the long-range dynamical behavior that manifests itself as 1/f noise, butterfly effect, and the scale-free statistics of sudden (instantonic) processes, e.g., earthquakes, neuroavalanches, solar flares etc., known as the Zipf's law and the Richter scale. SUSY is also sometimes studied mathematically for its intrinsic properties. This is because it describes complex fields satisfying a property known as holomorphy, which allows holomorphic quantities to be exactly computed. This makes supersymmetric models useful "toy models" of more realistic theories. A prime example of this has been the demonstration of S-duality in four-dimensional gauge theories that interchanges particles and monopoles. The proof of the Atiyah-Singer index theorem is much simplified by the use of supersymmetric quantum mechanics. Supersymmetry is part of superstring theory, a string theory of quantum gravity, although it could in theory be a component of other quantum gravity theories as well, such as loop quantum gravity. For superstring theory to be consistent, supersymmetry seems to be required at some level (although it may be a strongly broken symmetry). If experimental evidence confirms supersymmetry in the form of supersymmetric particles such as the neutralino that is often believed to be the lightest superpartner, some people believe this would be a major boost to superstring theory. Since supersymmetry is a required component of superstring theory, any discovered supersymmetry would be consistent with superstring theory. If the Large Hadron Collider and other major particle physics experiments fail to detect supersymmetric partners, many versions of superstring theory which had predicted certain low mass superpartners to existing particles may need to be significantly revised. Supersymmetry appears in many related contexts of theoretical physics. It is possible to have multiple supersymmetries and also have supersymmetric extra dimensions. It is possible to have more than one kind of supersymmetry transformation. Theories with more than one supersymmetry transformation are known as extended supersymmetric theories. The more supersymmetry a theory has, the more constrained are the field content and interactions. Typically the number of copies of a supersymmetry is a power of 2, i.e. 1, 2, 4, 8. In four dimensions, a spinor has four degrees of freedom and thus the minimal number of supersymmetry generators is four in four dimensions and having eight copies of supersymmetry means that there are 32 supersymmetry generators. The maximal number of supersymmetry generators possible is 32. Theories with more than 32 supersymmetry generators automatically have massless fields with spin greater than 2. It is not known how to make massless fields with spin greater than two interact, so the maximal number of supersymmetry generators considered is 32. This is due to the Weinberg-Witten theorem. This corresponds to an N = 8 supersymmetry theory. Theories with 32 supersymmetries automatically have a graviton. It is possible to have supersymmetry in dimensions other than four. Because the properties of spinors change drastically between different dimensions, each dimension has its characteristic. In d dimensions, the size of spinors is approximately 2d/2 or 2(d − 1)/2. Since the maximum number of supersymmetries is 32,[why?] the greatest number of dimensions in which a supersymmetric theory can exist is eleven. Fractional supersymmetry is a generalization of the notion of supersymmetry in which the minimal positive amount of spin does not have to be ​1⁄2 but can be an arbitrary ​1⁄N for integer value of N. Such a generalization is possible in two or fewer spacetime dimensions. Supersymmetric models are constrained by a variety of experiments, including measurements of low-energy observables – for example, the anomalous magnetic moment of the muon at Fermilab; the WMAP dark matter density measurement and direct detection experiments – for example, XENON-100 and LUX; and by particle collider experiments, including B-physics, Higgs phenomenology and direct searches for superpartners (sparticles), at the Large Electron–Positron Collider, Tevatron and the LHC. Historically, the tightest limits were from direct production at colliders. The first mass limits for squarks and gluinos were made at CERN by the UA1 experiment and the UA2 experiment at the Super Proton Synchrotron. LEP later set very strong limits, which in 2006 were extended by the D0 experiment at the Tevatron. From 2003-2015, WMAP's and Planck's dark matter density measurements have strongly constrained supersymmetry models, which, if they explain dark matter, have to be tuned to invoke a particular mechanism to sufficiently reduce the neutralino density. Prior to the beginning of the LHC, in 2009, fits of available data to CMSSM and NUHM1 indicated that squarks and gluinos were most likely to have masses in the 500 to 800 GeV range, though values as high as 2.5 TeV were allowed with low probabilities. Neutralinos and sleptons were expected to be quite light, with the lightest neutralino and the lightest stau most likely to be found between 100 and 150 GeV. The first run of the LHC found no evidence for supersymmetry, and, as a result, surpassed existing experimental limits from the Large Electron–Positron Collider and Tevatron and partially excluded the aforementioned expected ranges. In 2011–12, the LHC discovered a Higgs boson with a mass of about 125 GeV, and with couplings to fermions and bosons which are consistent with the Standard Model. The MSSM predicts that the mass of the lightest Higgs boson should not be much higher than the mass of the Z boson, and, in the absence of fine tuning (with the supersymmetry breaking scale on the order of 1 TeV), should not exceed 135 GeV. The LHC result seemed problematic for the minimal supersymmetric model, as the value of 125 GeV is relatively large for the model and can only be achieved with large radiative loop corrections from top squarks, which many theorists had considered to be "unnatural" (see naturalness (physics) and fine tuning). ^ Haber, Howie. "SUPERSYMMETRY, PART I (THEORY)" (PDF). Reviews, Tables and Plots. Particle Data Group (PDG). Retrieved 8 July 2015. ^ "supersymmetry". Merriam-Webster. Retrieved October 2, 2017. ^ Martin, Stephen P. (1997). "A Supersymmetry Primer". Perspectives on Supersymmetry. Advanced Series on Directions in High Energy Physics. 18. pp. 1–98. arXiv:hep-ph/9709356. doi:10.1142/9789812839657_0001. ISBN 978-981-02-3553-6. ^ Baer, Howard; Tata, Xerxes (2006). Weak scale supersymmetry: From superfields to scattering events. ^ Dine, Michael (2007). Supersymmetry and String Theory: Beyond the Standard Model. p. 169. ^ "ATLAS Supersymmetry Public Results". ATLAS, CERN. Retrieved 2017-09-24. ^ "CMS Supersymmetry Public Results". CMS, CERN. Retrieved 2017-09-24. ^ Baron, J.; Campbell, W. C.; Demille, D.; Doyle, J. M.; Gabrielse, G.; Gurevich, Y. V.; Hess, P. W.; Hutzler, N. R.; Kirilov, E.; Kozyryev, I.; O'Leary, B. R.; Panda, C. D.; Parsons, M. F.; Petrik, E. S.; Spaun, B.; Vutha, A. C.; West, A. D.; West, A. D. (2014). "Order of Magnitude Smaller Limit on the Electric Dipole Moment of the Electron". Science. 343 (6168): 269–272. arXiv:1310.7534. doi:10.1126/science.1248213. PMID 24356114. ^ Wolchover, Natalie (August 9, 2016). "What No New Particles Means for Physics". Quanta Magazine. ^ Howard Baer; Vernon Barger; Dan Mickelson (September 2013). "How conventional measures overestimate electroweak fine-tuning in supersymmetric theory". Physical Review D. 88 (9): 095013. arXiv:1309.2984. Bibcode:2013PhRvD..88i5013B. doi:10.1103/PhysRevD.88.095013. ^ Howard Baer; et al. (December 2012). "Radiative natural supersymmetry: Reconciling electroweak fine-tuning and the Higgs boson mass". Physical Review D. 87 (11): 115028. arXiv:1212.2655. Bibcode:2013PhRvD..87k5028B. doi:10.1103/PhysRevD.87.115028. ^ David, Curtin (August 2011). "MODEL BUILDING AND COLLIDER PHYSICS ABOVE THE WEAK SCAE" (PDF) (COLLIDER PHYSICS ABOVE THE WEAK SCALE). ^ H. Miyazawa (1966). "Baryon Number Changing Currents". Prog. Theor. Phys. 36 (6): 1266–1276. Bibcode:1966PThPh..36.1266M. doi:10.1143/PTP.36.1266. ^ H. Miyazawa (1968). "Spinor Currents and Symmetries of Baryons and Mesons". Phys. Rev. 170 (5): 1586–1590. Bibcode:1968PhRv..170.1586M. doi:10.1103/PhysRev.170.1586. ^ Gervais, J.-L.; Sakita, B. (1971). "Field theory interpretation of supergauges in dual models". Nuclear Physics B. 34 (2): 632–639. Bibcode:1971NuPhB..34..632G. doi:10.1016/0550-3213(71)90351-8. ^ Ramond, P. (1971). "Dual Theory for Free Fermions". Physical Review D. 3 (10): 2415–2418. Bibcode:1971PhRvD...3.2415R. doi:10.1103/PhysRevD.3.2415. ^ Wess, J.; Zumino, B. (1974). "Supergauge transformations in four dimensions". Nuclear Physics B (Submitted manuscript). 70 (1): 39–50. Bibcode:1974NuPhB..70...39W. doi:10.1016/0550-3213(74)90355-1. ^ Iachello, F. (1980). "Dynamical Supersymmetries in Nuclei". Physical Review Letters. 44 (12): 772–775. Bibcode:1980PhRvL..44..772I. doi:10.1103/PhysRevLett.44.772. ^ Friedan, D.; Qiu, Z.; Shenker, S. (1984). "Conformal Invariance, Unitarity, and Critical Exponents in Two Dimensions". Physical Review Letters. 52 (18): 1575–1578. Bibcode:1984PhRvL..52.1575F. doi:10.1103/PhysRevLett.52.1575. ^ Supersymmetry in Disorder and Chaos, Konstantin Efetov, Cambridge University Press, 1997. ^ Miri, M.-A. ; Heinrich, M.; El-Ganainy, R.; Christodoulides, D. N. (2013). "Superymmetric optical structures". Physical Review Letters. 110 (23): 233902. arXiv:1304.6646. Bibcode:2013PhRvL.110w3902M. doi:10.1103/PhysRevLett.110.233902. PMID 25167493. ^ Heinrich, M.; Miri, M.-A. ; Stützer, S.; El-Ganainy, R.; Nolte, S.; Szameit, A.; Christodoulides, D. N. (2014). "Superymmetric mode converters". Nature Communications. 5: 3698. arXiv:1401.5734. Bibcode:2014NatCo...5E3698H. doi:10.1038/ncomms4698. PMID 24739256. ^ Miri, M.-A. ; Heinrich, Matthias; Christodoulides, D. N. (2014). "SUSY-inspired one-dimensional transformation optics". Optica. 1 (2): 89–95. arXiv:1408.0832. doi:10.1364/OPTICA.1.000089. Retrieved August 6, 2014. ^ Ovchinnikov, Igor (March 2016). "Introduction to Supersymmetric Theory of Stochastics". Entropy. 18 (4): 108. arXiv:1511.03393. Bibcode:2016Entrp..18..108O. doi:10.3390/e18040108. ^ Ovchinnikov, Igor; Ensslin, Torsten (April 2016). "Kinematic dynamo, supersymmetry breaking, and chaos". Physical Review D. 93 (8): 085023. arXiv:1512.01651. Bibcode:2016PhRvD..93h5023O. doi:10.1103/PhysRevD.93.085023. ^ Krasnitz, Michael (2003). 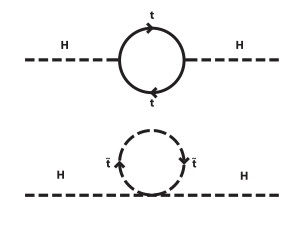 Correlation functions in supersymmetric gauge theories from supergravity fluctuations (PDF). Princeton University Department of Physics: Princeton University Department of Physics. p. 91. ^ The D0-Collaboration (2009). "Search for associated production of charginos and neutralinos in the trilepton final state using 2.3 fb−1 of data". Physics Letters B. 680 (1): 34–43. arXiv:0901.0646. Bibcode:2009PhLB..680...34D. doi:10.1016/j.physletb.2009.08.011. hdl:10211.3/195394. ^ The D0 Collaboration (2008). "Search for squarks and gluinos in events with jets and missing transverse energy using 2.1 fb-1 of pp¯ collision data at s=1.96 TeV". Physics Letters B. 660 (5): 449–457. arXiv:0712.3805. Bibcode:2008PhLB..660..449D. doi:10.1016/j.physletb.2008.01.042. ^ O. Buchmueller; et al. (2009). "Likelihood Functions for Supersymmetric Observables in Frequentist Analyses of the CMSSM and NUHM1". The European Physical Journal C. 64 (3): 391–415. arXiv:0907.5568. Bibcode:2009EPJC...64..391B. doi:10.1140/epjc/s10052-009-1159-z. ^ Roszkowski, Leszek; Sessolo, Enrico Maria; Williams, Andrew J. (11 August 2014). "What next for the CMSSM and the NUHM: improved prospects for superpartner and dark matter detection". Journal of High Energy Physics. 2014 (8): 67. arXiv:1405.4289. Bibcode:2014JHEP...08..067R. doi:10.1007/JHEP08(2014)067. ^ Marcela Carena and Howard E. Haber; Haber (2003). "Higgs Boson Theory and Phenomenology". Progress in Particle and Nuclear Physics. 50 (1): 63–152. arXiv:hep-ph/0208209. Bibcode:2003PrPNP..50...63C. doi:10.1016/S0146-6410(02)00177-1. ^ Draper, Patrick; et al. (December 2011). "Implications of a 125 GeV Higgs for the MSSM and Low-Scale SUSY Breaking". Physical Review D. 85 (9): 095007. arXiv:1112.3068. Bibcode:2012PhRvD..85i5007D. doi:10.1103/PhysRevD.85.095007. Supersymmetry and Supergravity page in String Theory Wiki lists more books and reviews. S. Martin (2011). "A Supersymmetry Primer". Perspectives on Supersymmetry. Advanced Series on Directions in High Energy Physics. 18. pp. 1–98. arXiv:hep-ph/9709356. doi:10.1142/9789812839657_0001. ISBN 978-981-02-3553-6. Joseph D. Lykken (1996). "Introduction to Supersymmetry". arXiv:hep-th/9612114. Manuel Drees (1996). "An Introduction to Supersymmetry". arXiv:hep-ph/9611409. Adel Bilal (2001). "Introduction to Supersymmetry". arXiv:hep-th/0101055. Weak Scale Supersymmetry by Howard Baer and Xerxes Tata, 2006.
Cooper, F.; Khare, A.; Sukhatme, U. (1995). "Supersymmetry and quantum mechanics". Physics Reports (Submitted manuscript). 251 (5–6): 267–385. arXiv:hep-th/9405029. Bibcode:1995PhR...251..267C. doi:10.1016/0370-1573(94)00080-M. (arXiv:hep-th/9405029). Junker, G. (1996). Supersymmetric Methods in Quantum and Statistical Physics. doi:10.1007/978-3-642-61194-0. ISBN 978-3-540-61591-0. .
Kane, Gordon L., Supersymmetry: Unveiling the Ultimate Laws of Nature, Basic Books, New York (2001). ISBN 0-7382-0489-7. Drees, Manuel, Godbole, Rohini, and Roy, Probir, Theory & Phenomenology of Sparticles, World Scientific, Singapore (2005), ISBN 9-810-23739-1. Kane, Gordon L., and Shifman, M., eds. The Supersymmetric World: The Beginnings of the Theory, World Scientific, Singapore (2000). ISBN 981-02-4522-X. Müller-Kirsten, Harald J. W., and Wiedemann, Armin, Introduction to Supersymmetry, 2nd ed., World Scientific, Singapore (2010). ISBN 978-981-4293-41-9. Weinberg, Steven, The Quantum Theory of Fields, Volume 3: Supersymmetry, Cambridge University Press, Cambridge, (1999). ISBN 0-521-66000-9. Wess, Julius, and Jonathan Bagger, Supersymmetry and Supergravity, Princeton University Press, Princeton, (1992). ISBN 0-691-02530-4. Duplij, Steven (2003). Concise Encyclopedia of Supersymmetry. doi:10.1007/1-4020-4522-0. ISBN 978-1-4020-1338-6. Bennett GW; Muon (g−2) Collaboration; Bousquet; Brown; Bunce; Carey; Cushman; Danby; Debevec; Deile; Deng; Dhawan; Druzhinin; Duong; Farley; Fedotovich; Gray; Grigoriev; Grosse-Perdekamp; Grossmann; Hare; Hertzog; Huang; Hughes; Iwasaki; Jungmann; Kawall; Khazin; Krienen; Kronkvist; et al. (2004). "Measurement of the negative muon anomalous magnetic moment to 0.7 ppm". Physical Review Letters. 92 (16): 161802. arXiv:hep-ex/0401008. Bibcode:2004PhRvL..92p1802B. doi:10.1103/PhysRevLett.92.161802. PMID 15169217. Brookhaven National Laboratory (Jan. 8, 2004). New g−2 measurement deviates further from Standard Model. Press Release. Fermi National Accelerator Laboratory (Sept 25, 2006). Fermilab's CDF scientists have discovered the quick-change behavior of the B-sub-s meson. Press Release.